Use this orca steamer to humidify your home. The base is a cast iron baked enamel base and the top is made of porcelain. Steam rises from the orca's blow hole. 2.5 quart capacity. Also available as a dragon steamer. 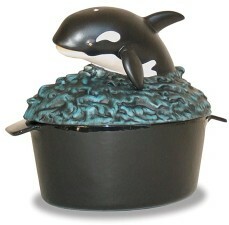 Use this orca steamer to humidify your home.